We (Mike the Poolman and family) are grateful for a long list of satisfied customers. Customers are the best judges of a company's integrity. Since 1995, we have built solid relationships with pool owners for both Pool Maintenance and Pool Service throughout the Sacramento region. This trust between customer and contractor is the foundation of our reputation. My journey in the swimming pool business began in 1992. I was broke and needed to pay rent and found a part-time job cleaning pools for a wonderful couple managing Premier Pools Service Department out of their home. We all quickly discovered that I was a natural and within six months I was invited by the owners at Premier to become a salesman in the expanding pool construction department. That didn't work out too well and I was transferred to the remodel department. That didn't work out either and all the while I was kicking and screaming and soon found myself back in the (now in-house) service department. I didn't realize it for years to come but thanks to the owner's insistence that I attend new construction and remodel sites, I had gained invaluable knowledge as to how pools are built, remodeled, the sales process, customer relations, and, my own maturity. Before long I was asked to manage the service department and in 1995 Premier Pools and Spas generously sold part of their service route to me. On October 1, 1995 my business launched and with my need to constantly learn I devoured every swimming pool educational course I could find near and far. Within a few years I unexpectedly found other pool techs calling me for advice and demand for my services has consistently grown. And, the second most asked question: How did I come up with the name Mike the Poolman ? Quite innocently- when I worked for Premier a few of our customers' children (now grown!) used to refer to me as "Mike the Pool man". It was fun and I went with it never realizing it would become as marketable or successful as it has. Years later my simple philosophy remains the same: do what's best for the customer and business will thrive. I hope you are having a nice day and thanks for reading. Weekly swimming pool service, cleaning and maintenance in Folsom and El Dorado Hills, CA. Variable speed pool pump installation in Folsom, El Dorado Hills, Orangevale, Fair Oaks, Gold River, Granite Bay, Rescue and Cameron Park. Certified and Licensed for your PG&E and SMUD rebate! We are factory trained in all phases of equipment service, repair, replacement and energy efficient upgrades. Hello, I started cleaning pools to pay the rent in 1992 and quickly discovered a talent for understanding and troubleshooting swimming pool issues. 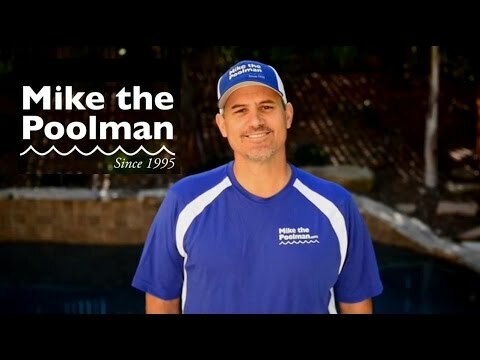 I started my own business, Mike the Poolman, in 1995 and have continued to grow ever since. I regularly attend continuing education courses and love making pool owners happy. I service and repair pools in Folsom and El Dorado Hills, CA. I want to tell you how pleased I am with your service. It is simply outstanding. You are great at all the standard pool service, but what I am especially appreciative of is the extra service your give. You watch over the complete operation of the pool/spa system, and have proactively recognized and addressed several equipment issues for me. I like how you communicate with me on a regular basis, and follow up to address problems and then make sure that everything is working properly. When equipment service is required you do it very quickly, with high quality and at a very fair price. I am so pleased that I selected Mike The Poolman - great job! We have had Mike the Poolman help us out with various pool problems through the years. I cannot say enough good things about him. He is reliable, knowledgeable, honest and his prices are fair. He does not try to sell you something you don't need but he will let you know if something needs repair. It is very refreshing to see that there are still honest businessmen out there like Mike. We will continue to call him for all of our pool needs in the future. Mike services our rental pool and does a great job! Because we can't see the pool regularly, it's nice to know that he'll let us know if any issues arise! We highly recommend him! Mike was great. I emailed him about coming out to fix my broken solar heater for the pool. He was booked up but took the time that evening to write me a response about something I could do myself to fix it since he was unavailable. Over an email he was able to diagnose my problem, I changed out a part, and now it works great. My wife and I consider ourselves fortunate to have Mike replace our old malfunctioning pump with a new energy saving variable speed pump. Much quieter and more power when needed. Mikes attention to detail throughout the job was great. He came back the next day as promised to follow up on some possible loose ends. He was very Patient in answering all my questions regarding proper pool maintenance. Highly recommend Mike the Poolman. We love Mike! He and his team provide fabulous care for our pool, but even more importantly, I completely trust him. He truly cares about his customers and treats them with honesty and integrity. He provided us exactly the guidance we needed when we were battling with a horrible controller that was installed as part of our solar heater, and now we have a much better controller that is easy to understand and use. He always goes above and beyond when taking care of customers. I would never replace him. I met Mike out at the Prairie City MTB races, and had heard good things about him, so I asked him if he could come over and take a look at an exposed re-bar issue in my pool. Mike came over and evaluated the rust damage, and provided me with an estimate. I didn't want to delay the work any further, as the rust and corrosion was only going to get worse. After draining the pool the night before, Mike and his crew showed up at 7:30am as promised, and were done by 11am. The quality of the work was excellent, which made it easy to hire Mike for the next pool issue. My two-speed pool pump stopped working in high speed mode, which drove the water through our solar panels on the roof. I asked Mike about it, and he recommended a variable speed pump as a replacement, that could be programmed to minimize power usage not only during normal filtering, but also when running solar. I had Mike go ahead and install, and program the new variable speed pump. While Mike was here, he noticed that my solar setup was all manual. He recommended some simple changes to convert it over to full automatic operation, and helped me save labor costs by doing some of the roof wiring myself. Bottom line, I had a great experience with Mike and would highly recommend him for any pool work.